What Is a “Certificate of Destruction”, and When Do I Receive It? A certificate of destruction is a formal document containing detailed information about the destruction of your papers that ensures the shredding process complied with all relevant security laws. These certificates help protect your company in case of legal action or an audit. When you hire a mobile shredding or off-site shredding company, it’s important to know if they detail every step of the shredding process and can document it for you. The certificate helps to prove that the documents you had shredded were securely destroyed. To ensure that you are protected, be sure to look for a shredding provider that offers a very detailed certificate of destruction. What Does a Thorough Certificate of Destruction Look Like? Before you agree to have a shredding company destroy your documents, be sure to ask if they provide a certificate of destruction. 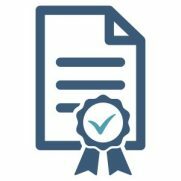 Have them detail what’s included on their certificate to ensure you have all the necessary requirements by law or for your industry. Not all shredding companies provide certificates of destruction, but if yours does, you can expect to receive your certificate anywhere within a week of whenever the shredding was performed, and many offer them same day. Shred Nations partners with certified and reliable shredding companies throughout the U.S. Call us today at (800) 747-3365 or fill out the form on the right and we will connect you to several secure document shredders in your area.